I recently finished Perfection by Julie Metz. When I first opened it up, I thought it would make for a nice relaxing read, something I can do with the girls color or play on the computer. I was wrong. I would stay up late reading this novel, I would go out to my vehicle during my lunch hour at work to read another chapter or two. The story stayed with me and wouldn’t let go. It was powerful, and soon you’ll see why. I have a treat for you! I’m giving away a copy of Perfection! All you need to do is leave a comment below, no strings attached, because yes, it’s that powerful of a book. My next treat – tomorrow I have a special guest post by Julie herself! And it’s one that will speak to everyone I believe. 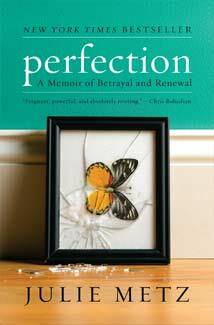 Perfection has had comments listed as “heart-wrenching and utterly gripping” by both Glamour and Redbook. Infidelity has become common place in our society today, almost to the point that we shrug it off with barely a thought when we hear about it. But what about those who are ensnared by its betrayal? What if YOU were the one to go through this? That thought kept going through my mind as I read this book. How would I react if I were in Julie’s shoes? How would I explain to my children about what happened? If I were to meet the women face to face, how would I react? What if my husband were to die BEFORE I found out about his ‘secret’ life? Julie Metz, a New York Times Bestseller, shares her heart-wrenching story of this. She shares the story of how she came to terms with painful truths and how she rebuilt a life and an identity after infidelity and widowhood. One January afternoon, Julie’s life is drastically altered when her husband collapsed on their kitchen floor and left Julie a widow and single mother. As she struggles to pick up the pieces of her life, she discovers a betrayal deeper than death for her. Her husband had a secret life, one that was centered around finding ‘umami’ (the moment of perfection). But it’s not just one woman in her husband’s secret life. Its many. In Perfection, Julie shares her journey through chaos and gradual transformation toward a new life for herself and her daughter. Her memoir serves as a cautionary tale that will speak to women everywhere and tel them to trust their intuition. She proves that what does not kill you will only make you stronger. Perfection is a story that is a must read. Julie Metz is a graphic designer, artist and freelance writer whose essays have appeared in publications including The New York Times, The Huffington Post, Hemispheres, Glamour, and more. Julie received a MacDowell Fellowship in 2008 where she completed work on Perfection and began work on a novel. She lives in Brooklyn, N.Y.
>Powerful description. Sounds like something I need to read! Thanks for sharing! >That cover says a lot in itself. Even your description sounds hard-wrenching.